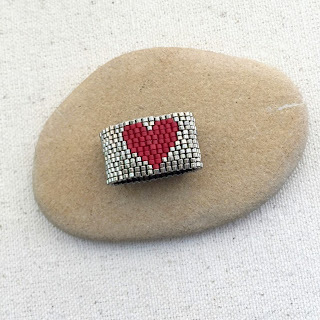 On an impulse a month or so ago, I bought some beadwork design software. That's when it started... and when I disappeared from my blog. 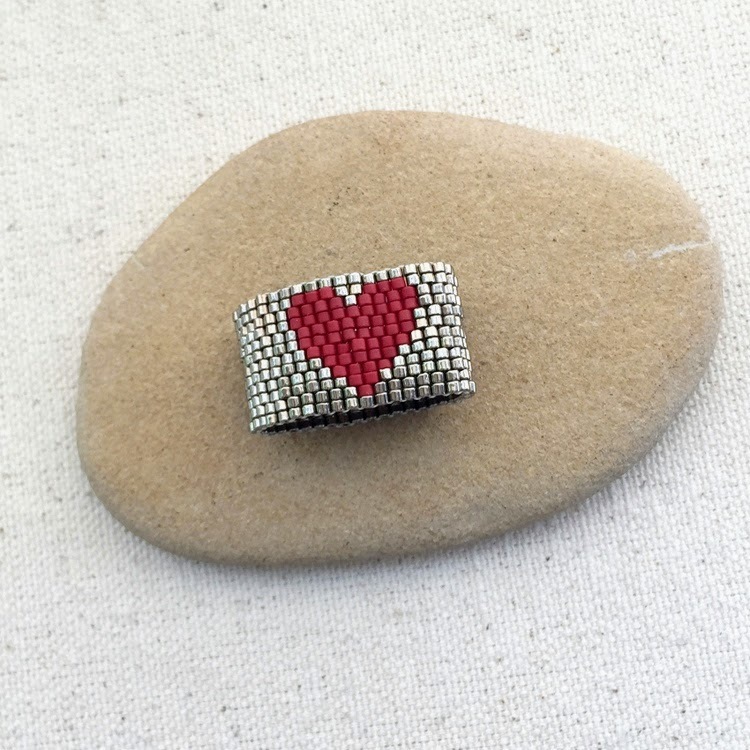 First, I designed and made this great peyote stitch beaded heart ring tutorial. And then, these even count peyote spiral tube earrings. Then, I realized that in order to use the beading software effectively, I had to catalog, label and organize all of my seed beads. Organizing them helps because then I have a palette available of only the colors and types in my collection. And once I did most of them, I realized the entire collection was ho-hum boring, and I needed to buy many more colors. 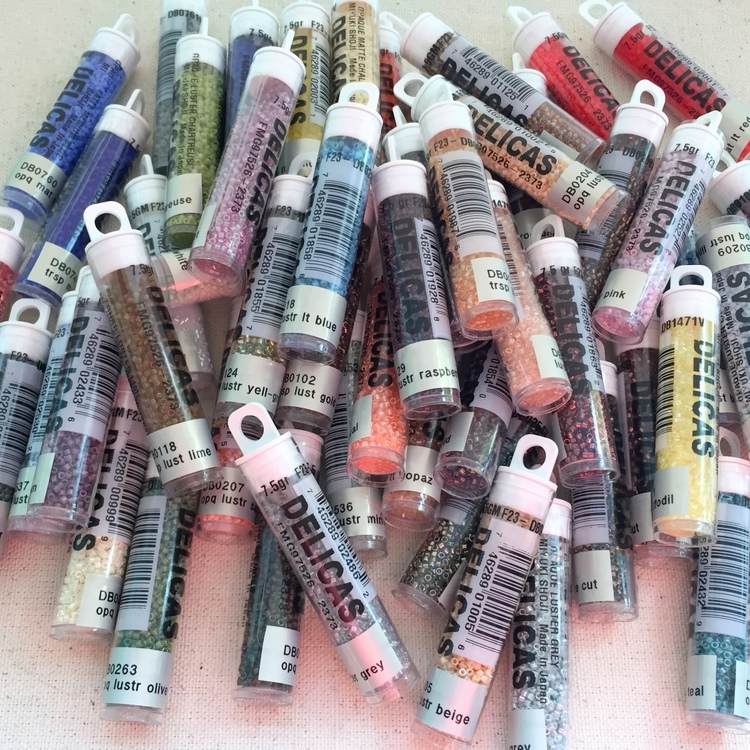 About eighty tubes of 11/0 delicas (a small portion of which is pictured above) and sixty hanks of 11/0 Czech beads later, I'm back! But I also just bought another twenty assorted 6/0, 8/0 and 11/0 Tohos because they were on sale. OK, there was one color of 15/0's in there too. And then there's the new organizers I needed for all of the beads. And new rolls of tape for my Brother P Touch label maker and I'm finally ready to design more jewelry! Or at least write more about my jewelry. Now that I have this many fabulous beads, I know the next problem is going to be choosing which ones to use. That's not really true. (Maybe just a little). Playing catch up - here are a few projects that you may have missed. 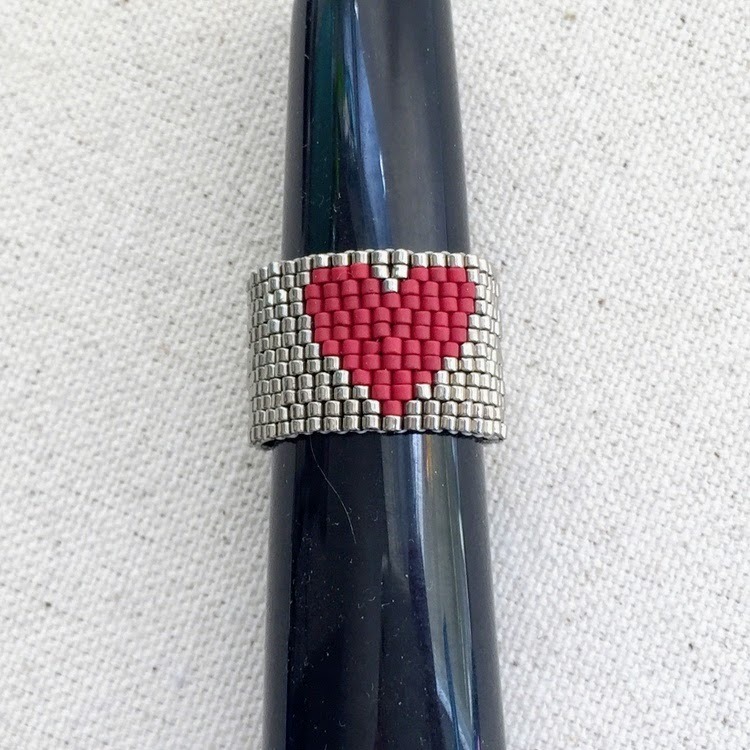 One of my last projects posted here was the pattern for this wide band peyote heart ring. A really fun design. 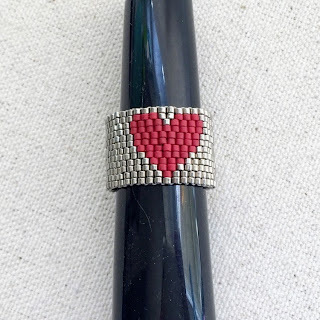 I've been updating a lot of the old articles at the beadwork site and a recent one was two drop peyote, I figured the best way to see the difference between the regular even count peyote stitch and two drop peyote stitch is to make the same design using each stitch. I had to remake the pattern, but the first thing I noticed and loved about two drop peyote is how you can make better curves and shapes with the stitch. I really prefer a more rounded and full heart shape. Big bonus for two drop peyote! The second bonus: two drop peyote stitches up almost twice as quickly as single drop peyote. It makes sense when you think about it. 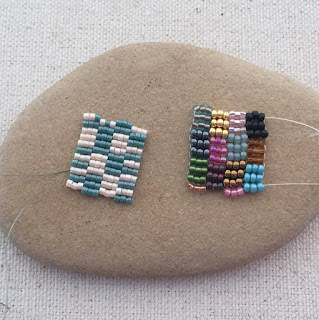 Same exact thread path - but you are picking up twice as many beads with each stitch. It isn't actually twice as fast, but it is definitely much quicker. So, let's just say, that so far, I'm a fan of two drop peyote. I tried playing a little bit with three drop peyote in the design software - and I don't think I'll be making this heart design in three drop. It was not as easy to design, so I gave up. But three drop peyote is definitely a winner too - because it stitches up three times as fast! I just haven't exactly figured out how I want to use it yet. So far, I've just made a couple of swatches playing with pattern. I'm not sure why three drop peyote makes me want to work in 3x3 squares, but it obviously does. I guess it reminds me of a patchwork quilt. Obviously, I've had a few more things going on beadwork-wise, but at least I'm slightly caught up for now. It feels good to publish a post that has been in draft mode for over a month, so I'll consider that today's accomplishment and move on. I'll try to keep up a little better, but it is high school baseball and softball season, so I make no promises. 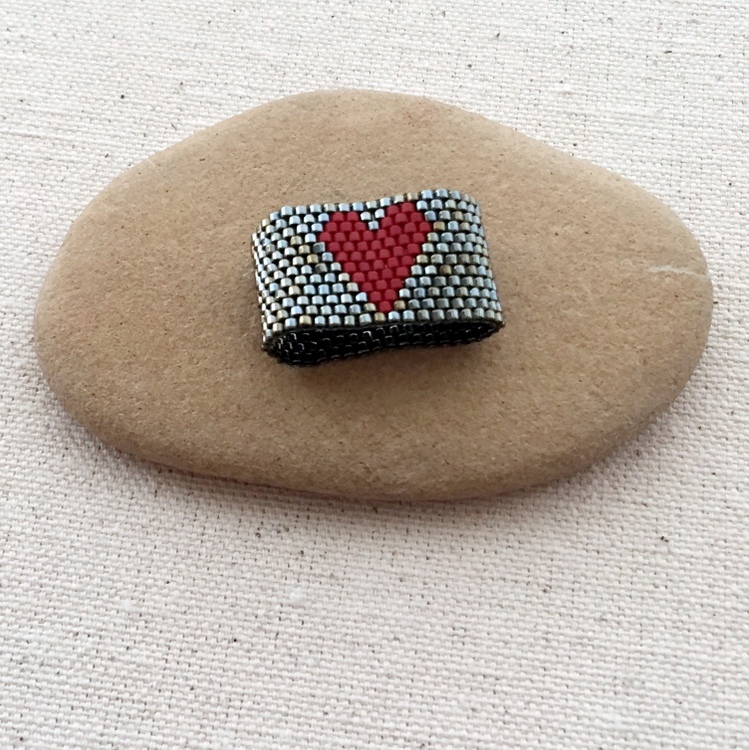 If you subscribe to my beadwork newsletter or follow me on Facebook, you'll know when I publish new projects at the beadwork site.